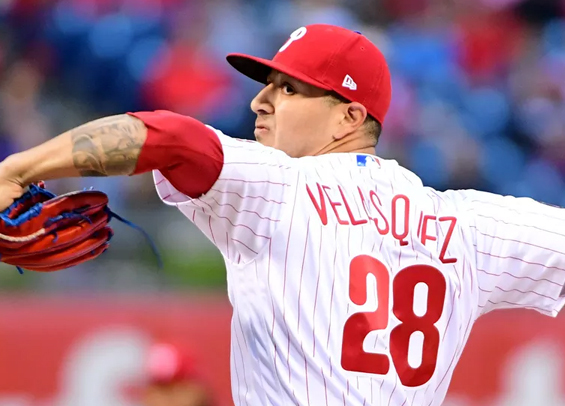 Vince Velasquez has been solid as of late for the Phillies, but he struggled on Wednesday surrendering four runs on six hits to Diamondbacks in a 6-0 loss at Chase Field. The loss, coupled with an Atlanta win, trims the Phillies lead to just a half-game in the NL East division standings. Velasquez worked through the first two innings unscathed but couldn't pitch beyond the fourth. He tossed 79 pitches, with just 47 being strikes. The effort marked the first time he surrendered more than three runs in an outing since June 19. The offense didn't do Velasquez any favors, collecting just four hits on the afternoon as D-Backs starter Patrick Corbin notched nine strikeouts over 7 1/3 innings. The Phillies have an off day on Thursday before opening a three-game set at PetCo Park on Friday night with the Padres. It'll be an important series for the Phils as the Pads have the lowest win total (45) in the National League. "This is very similar to what we always do," Phillies manager Gabe Kapler said following Wednesday's loss (see video). "We know how to turn the page. We don't let losses linger. You're going to go into a city like Phoenix against a very good team, and sometimes, you're going to win the series and there are going to be times where they just play better. Over the course of this series, they played better than us. It's part of baseball. But we will not carry that into San Diego. We will bring strength and enthusiasm and our brand of baseball to San Diego. I'm very confident we're going to perform well there." Zach Eflin will start the series opener for the Phillies. The Padres counter with rookie Jacob Nix who will be making his Major League debut.